Less than 2 weeks until Valentine's Day! Can you believe it? I feel like it was just yesterday that I was shopping for Christmas presents. But hey, I'll never give up a chance to shop (especially if it's for my best friend)! So today, I've put together a list of some unique, but affordable, Valentine's Day gifts that any guy would love! 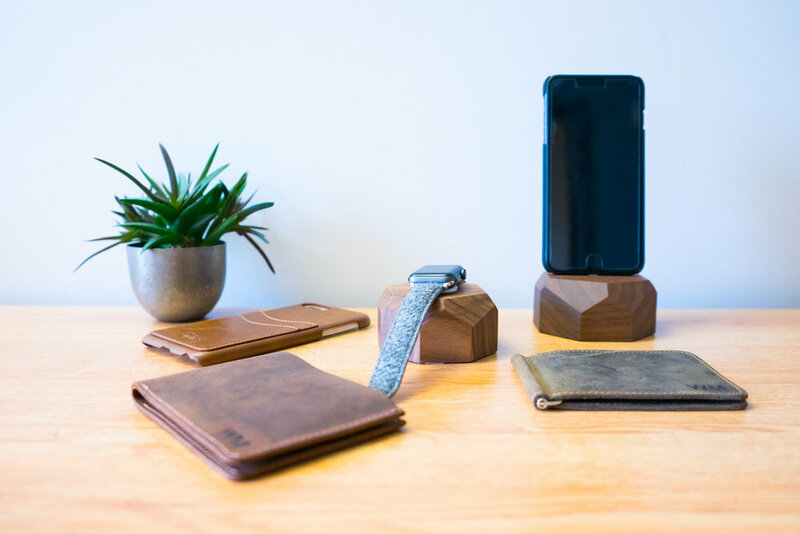 Give your man a little piece of nature this V Day with one of these beautiful wood charging stations by Oakywood! 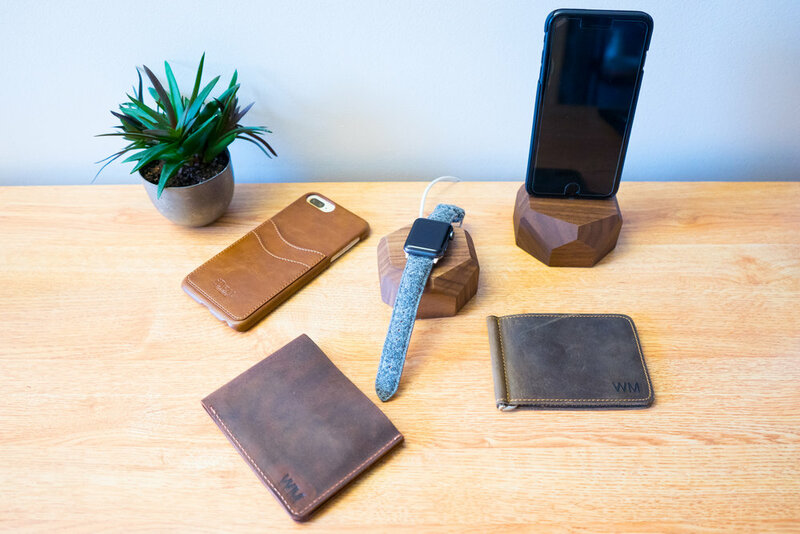 Featured here are two separate products, the Wood Apple Watch Charging Station and the Wood iPhone Charing Station, my personal favorites. But Oakywood also offers this dual charging station which is a two-in-one. The simple geometric design of these products are on theme with the popular minimalist home decor trend that's been all the rage. The stations are made with quality wood and come with stickers on the bottom to hold them in place once you know where you want to keep them. What better way to charge your technology than in one of these beautifully designed charing blocks? Does your man have a 10 y/o wallet that looks like it could use an upgrade? Yeah mine too. That's why I got my boyfriend this Personalized Leather Wallet, by Jeda Leather. 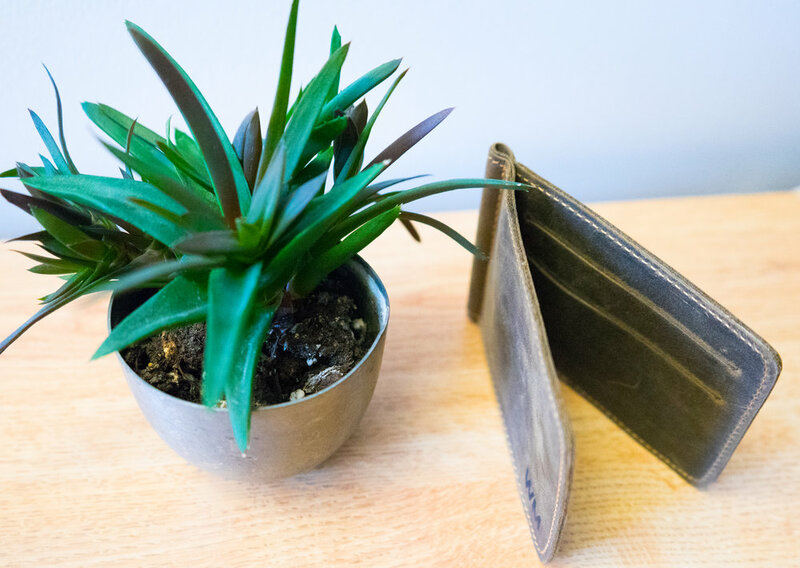 This beautifully stitched leather wallet has a rugged stylish design, with an incredible amount of card slots, likely to fit everything a guy could ever want in there. If he likes to carry the bare minimum, then I suggest checking out this Minimalist Personalized Leather Wallet, also by Jeda Leather. The fewer card slots and wallet clip interior are what contribute to it's slim design. The choice is difficult, I know! So instead, you could just go with both, which is what I did! One wallet can be for the hold-all purpose, and one can be for when he wants to carry light. I've seen so many apple watch bands out there but none like this Harris Tweed Ash Grey Apple Watch Band, by Vario! A tweed watch band?! How cool is that. Your man will be the most dapper guy at the party with this accessory. Also featured here is the same tweed band but in the Merlot color, which is just perfect for V Day don't ya think?. 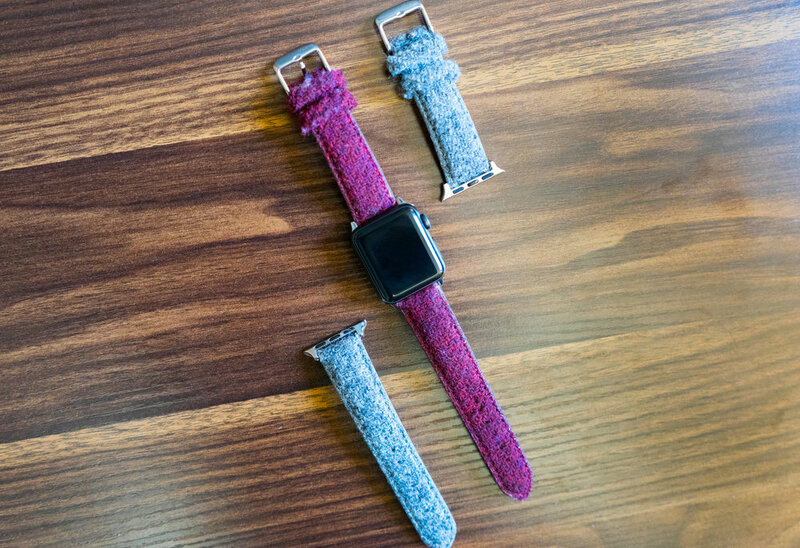 The apple watch isn't the most traditional looking watch if you know what I mean, but with the help of this tweed band it can be transformed into a classic and sophisticated accessory. I've been obsessed with phone cases lately, so it's as no surprise that I'm including one in this gift guide is it? While I've featured quite a few products from iDeal Of Sweden, this Dual Card Wallet Case, is the first of their masculine designs to hit BTFL. This case features a sophisticated leather design with a few card slots to keep the absolute necessities like his ID and a credit card. What better gift than this extremely practical and affordable one? A man giving a women a bouquet of flowers is probably one of the most cliche Valentine's Day gifts. To mix it up, you should considering gifting him some plants this year! And instead of roses, make it a succulent! Besides being extremely trendy right now, a succulent is a present that will last a lot longer than a bouquet of flowers. In fact, this gift could last forever if given the proper care, just like your love for each other. Too cheesy? Oh well, you see my point. If you're looking for gifts "for her," then check out my other V-DAY blog post.. Unique Valentine's Day Gift Ideas Under $60 - For Her! Hoping that everyone has a lovely Valentine's Day!